The martial arts has played a significant role in American and world history. From its earliest beginnings to its first step on U.S. soil, it has had a positive and influential effect on American history. From physical exercise, health awareness, anti-bullying, confidence building and more, it has changed the way Hollywood does fight choreography and created new forms of story-telling in film and television. The martial arts has also created a whole new industry of x-box and playstation games and launched the careers of Chuck Norris and Bruce Lee and it has opened new doors of anime into Western Society. The martial arts is a huge industry, over 27,000 known schools in America alone and millions of practitioners of the arts, it is somehow, a small community. It is that community who has supported the museum since its beginning. 100 percent of all items in the museum have been donated or on special loan. Experience the culture of China, its opera, drums and gongs, kung fu weaponry and archive uniforms. 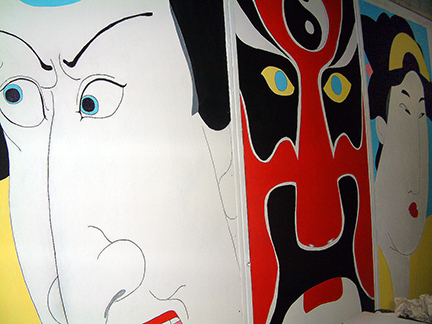 Learn about the history of Japan, the armor of the Samurai, kabuki, ninja, bunraku, martial arts items. Enjoy Billy Jack’s hat, Bong Soo Han’s uniforms, Korean weapons and fans. Take in the history of the secret art of Hawaiian Lua, it’s history, weaponry and culture. Learn about the culture of the Philippine people, LapuLapu, unique knives and wooden sticks. The Royal Thai Council has donated the drums, ching and other instruments, Muay Thai items. Find out about the history of Anime, Manga and Cosplay. A full timeline of Anime history is on display. From martial arts magazines to movie props from the Karate Kid, Enter the Ninja, Kung Pow movie plus an historical timeline of martial arts in various forms of media from radio to tv to film. Movies: Each section of museum contains a video explanation of each area.